June 2013 NLE results has been released by PRC. 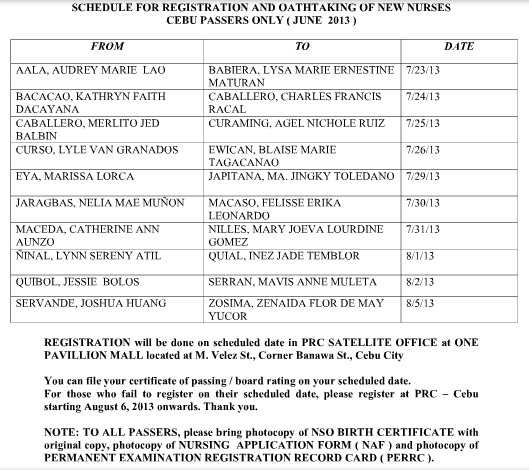 Nursing board exam passers next task now is to register, take oath and exercise nursing profession. Information regarding your registration, oathtaking schedule, requirements and venue and verification of ratings (VOR) are all available here as we update this site with details from reliable sources. Registration for the issuance of Professional Identification Card (ID) and Certificate of Registration will be announced later according to PRC during the release day of results. On the other hand, Regional Offices of PRC are also giving separate schedule of registration and oathtaking. June 2013 NLE passers are advised to use the Online Registration System (ORS) before proceeding to the PRC Offices. It has been activated for June 2013 NLE passers, click here. PRC Baguio - Initial registration for June 2013 NLE passers will start on July 16, 2013 (Tuesday) for Baguio, Laoag, Dagupan and Cabanatuan testing centers only. 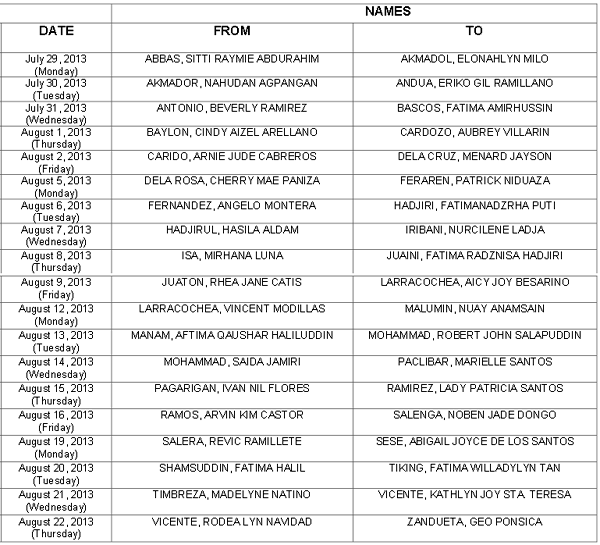 PRC Cebu - Schedule of registration for June 2013 Cebu passers starts on July 23 until August 5, 2013. Take note of some reminders from PRC Cebu. PRC Zamboanga - Registration schedule from July 29, 2013 until August 22, 2013 during these time: 8AM – 11AM and 1PM – 3PM. For those who will not be able to register on the schedule given, you may register after August 22, 2013. August 5: Abad, Allelee C. to Bernardo, Rev A.
August 6: Bernas, Janel Kaye R. To Daza, Ayezza Jin B.
August 7: Dazo, Jasmin D. to Garcia, Wilmarie O.
August 8: Garcisto, Martin P. to Magleo, Rhoda B.
August 12: Maglipon, Marie Joyce A. to Panaligan, Jan Henry F.
August 13: Pandong Ken J. to Sanchez, Zharmaine C.
August 14: Sandaga, Karla Mae R. to Zulueta, Roquito Jose M.
Registration starts on July 29, 2013 at PNA Davao Office. Oathtaking ceremony will be on August 16, 2013, 1:00- 5:00PM at SMX Convention Center, Lanang, Davao. Announcement from other PRC Regional Offices will be posted here once available. Through Verification of Ratings (VoR) online on PRC website, June 2013 NLE takers will be able to check grades by entering the required information in the appropriate fields. Some of the required information includes application number and birthdate. VOR for June 2013 NLE is now available.